Hi, my name is Jack. 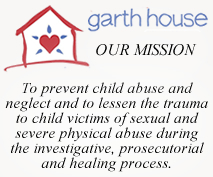 I go to work each day at Garth House. When I am working, I wear a red vest. I earned my vest through extensive training & competitions. My job is to give unconditional love and acceptance and to provide morale for all. I visit with more than 600 children a year. My fellow staff members say I make a difference in all the lives I touch. 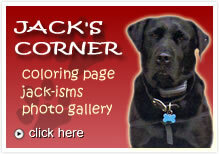 Jack is a symbol of security & faithful service to all and he will remain your friend today and always! Adobe Reader is required to view some of our pages. Mickey Mehaffy Children's Advocacy Program, Inc.